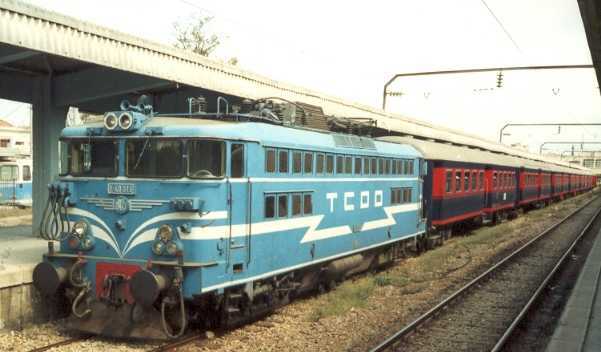 The E4000 were delivered to TCDD from 1971 to 1973. The first 8 locos were assembled by Alsthom at the Belfort factory. The subsequent 7 locomotives were assembled in Turkey, at the Haydarpaşa workshop. 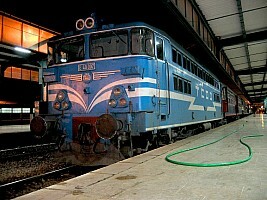 The E40000 are almost identical to SNCF (French Railways) BB17000. The BB17000 are themselves part of a family of medium power loco mass produced by Alsthom throughout the 60s and the mid 70s. The family included, first, the BB16500 (25KV), then the BB25000 (25KV & 1,5KV), the BB17000 (25KV) and finally the BB8500 (1,5KV). Overall, this family had 739 units of which 105 are BB17000 type. These locos have several key features from the SNCF school of though. First and foremost: the monomotor bogie where a single electric motor drives both axles through a chain of gears. These bogies where made possible by the reliability achieved by electrical motors. Before, increasing the number of motors was a sign of reliability through redundancy. But now, this was seen as a weakness: motor hardly failed anymore, and having a single motor procured a reduction in wiring and contactors, themselves leading to increased reliability. Having less motors and wiring brings another benefit: reduction in weight. In 1960, a single large DC motor weight about 30% less than two motors of equivalent combined power. This in turn brings cost savings. 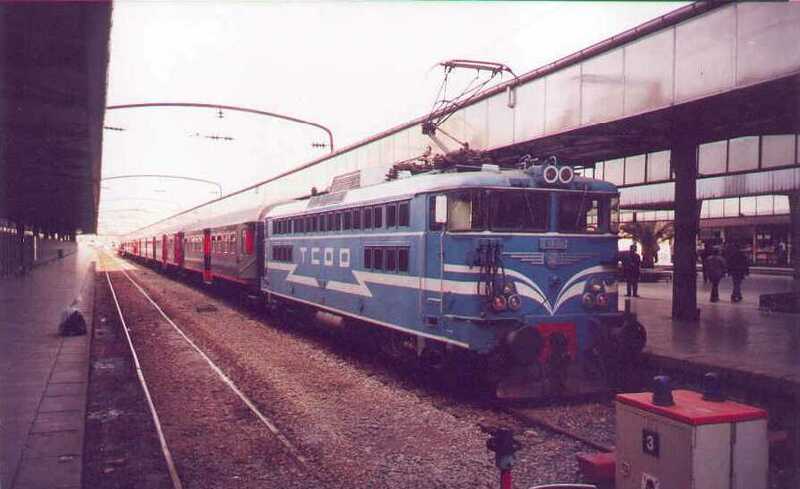 In late 1969, SNCF send BB25558 to Istanbul for a test campaign there. The loco was returned in January 1970. BB25558 was a dual voltage version, 25KV & 1,5KV, of the type. However, it's mechanical parts are identical to the BB17000 which is, in essence, a BB25500 without the 1,5KV equipment. The frame and body are built in steel. The body is of box type, made as compact as possible. There are no windows, except for the cabs. The air intakes are placed high on the body sides. Each intake is a square opening equipped with a filter. The bogies are B type made in welded steel. On the E40000, Alsthom made an exceptionally short and compact bogie, the axle box on the inside and the gears on the outside. The bogies are made of a square frame and two lateral boxes carrying the gears and sanding equipment. 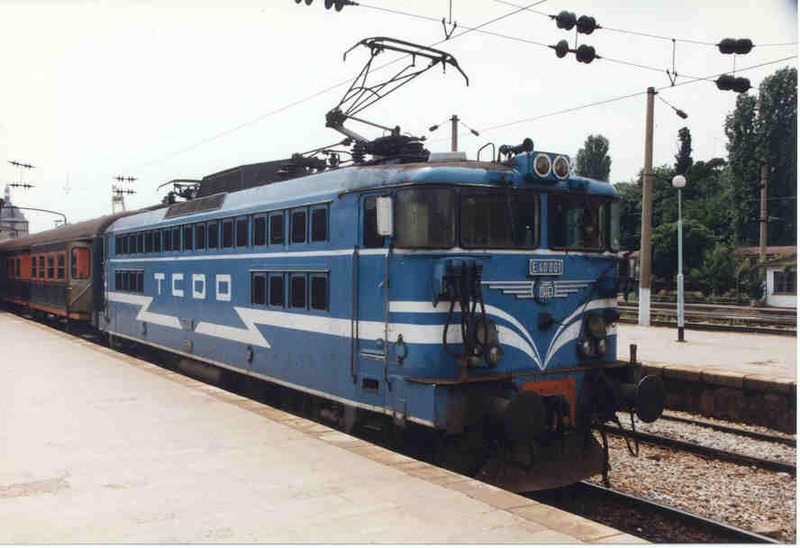 The traction effort is transmitted from the bogie to the loco body by traction bars placed in a low position. Coupling between the gears and the axles is done using an Alsthom elastic coupling. The axles, in effect coupled by the gear, have a better tractive power and there is not need to control axle slip, a difficult thing to do in those times. The E4000 gearing is a bit slower that than the BB17000, but has a higher tractive effort. The gear can be changed by the driver when the loco is stopped thanks to a lever placed inside the body. Thus the loco was meant to be equally suitable for passenger train and freight train. The gears had to be carefully maintained and the gear box was definitively a weakness. Maintenance shops responded by locking the gear box either in low gear or high gear, thus losing the benefit of dual speed in return for higher reliability. Being coupled, the wheel had to have the exact same diameter to prevent premature wear through wheel slip. In service, this very short bogie is less aggressive for the track than the long bogies commonly found with nose suspended locos. However, this bogie is known for the poor quality of the suspension, bringing much discomfort to the driver. Indeed the BB17000 are wildly known in France under the nickname “dancing girl" (“danseuse” in French). The primary suspension is made of spring connected by 4 rods to the axle box on the inside of the bogie and shock absorbers. The secondary suspension is realized by 4 springs in each corner of the bogie and two pivots with rubber articulation. These pivots have lateral shock absorbers. The suspension is completed by a shock absorber connected to the body on each side of the bogie. Another key feature of the E4000 is the diode rectifier bridge fed by a transformer with a tap changer for voltage adjustment. This was the standard practice since 1954 and the E4000 are the ultimate evolution of this diagram. Subsequent locomotive made by Alsthom were equipped with fixed voltage transformers and voltage adjustment by thyristor. Each motor has is feed from a rectifier bridge of 80 diodes. Each branch has 20 diodes arranged in an array of 4 parallels strings of 5 diodes in series. This arrangement was needed because at that time the industry could not make a diode able to withstand the 1200 amps required by the traction motors. The diodes were air cooled. The main transformer has a power of 4340 KVA, with separate windings for each motor rectifier and a winding for train heating. The tap changer has 32 positions placed on the high voltage side. The secondary side tension is 1500 V, for the traction motors and the equipments. In addition to the tap changer, there is a command system allowing 5 notches of motor shunting. Each bogie has one motor, type TO1074 DC. This motor is installed in the bogie and as a weight of 5350 Kg. Its nominal tension is 1500V. The motor has a one hour power of 1470 kW. The maximum speed is 785 rpm. The loco has two pantographs, type AM18 manufactured by Faiveley. They had a 1950mm wide contact. Only one pantograph is raised in normal service condition. It seems, but I cannot confirm, that some locomotives were equipped with 1600mm contact for service on the main line between Istanbul and Ankara. Subsequently, many E40000 lost their second pantograph when there service was limited to Istanbul suburbs. Brakes are air-controlled with 2 UIC type brake hoses. The loco is equipped with a direct brake control and a dynamic braking. The dynamic braking is of reosthatic type. It can be started from the main tension or a battery, therefore enabling dynamic braking even in the absence of catenary tension. The direct brake has a double brake shoe per wheel. The brake shoe is made of cast iron. There is a brake cylinder per bogie. The loco has also a parking brake activated by a wheel. Compressed air is supplied by a two compressors. Both are piston type. The main compressor can deliver 2250 liters of air per minute under 8 bars, the secondary one 119 liters per minute under 7 bars. Batteries are of Cadmium Nickel type. There are 3 blocs: one per traction motors, one for the dynamic braking and for the locomotive control equipment. The main transformer has a third secondary winding for auxiliary power. 1500V for electric train heating and power for the locomotive auxiliary equipment are taken directly from winding, A secondary transformer reduces the voltage from 1500V to 750V for some equipment. Finally, the locomotive has a 72V network for low tension equipments. In addition to vibration and noise, the driver was not helped by the cab, which was done as small as possible, in true French practice of poorly designed cabs. The E4000 retained the rounded angle windows in the cab. This feature present on the early BB16500 and some BB8500 was not kept on the BB17000 because the SNCF felt the need to strengthen the cab and somewhat improve the driving condition by reducing lateral light. The E40000 cab layout was identical to the BB17000, except that the driving position was on the right side of course! This cab allowed for a standing or a sitting driving position. Back in the late 1960s, some drivers still preferred the standing position, an age old habit acquired in the steam engines. The main feature of the cab is the wheel to change the traction notches as well as the dynamic braking notches. The camshaft beneath that wheel is connected to low voltage contactors that activates the related high voltage equipment. 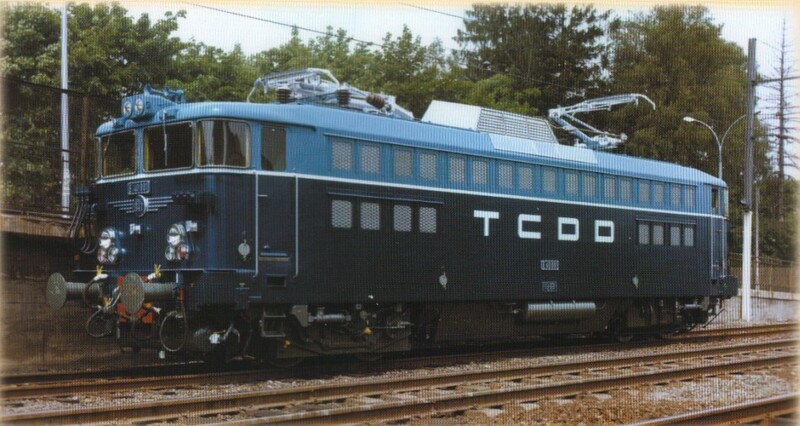 The loco has a 2 tones horn: 330 and 650 Hz frequency. The two tones are played separately. The BB17000 were styled by Paul Arzens, a famous French designer who had a near monopoly on all SNCF rolling stock from the 1950s to the mid 1980s. Jacques Cooper, Alsthom internal designer, did a new livery for the E4000 only as he could not change the shape of the body. He drew a two tone blue livery: navy blue below the windows, turquoise blue above and a white strip belting the body between the two colors. BB17000 of Arzens were green. 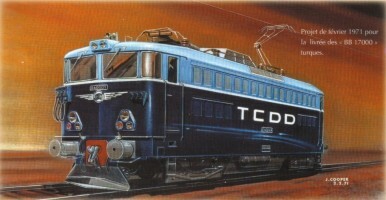 TCDD main change to the livery was to add white mustaches to the front end, extended on the sides with a zebra shape around TCDD logo. 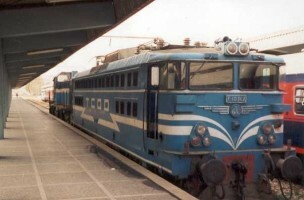 A second change occurred when the two tone blue livery was replaced by a one tone turquoise blue all over. The E4000 were delivered to TCDD at a time were only suburbs of Istanbul and Ankara were electrified. These medium power locos were perfectly suited for this service. The longest service performed was the stopping service Haydarpaşa to Adapazarı (about 140 km). Unfortunately, the E4000 were already 20 years old when the Istanbul Ankara electrification was completed and they saw little service on this line throughout, being displaced on this service by the E43000 and the E52500. To compensate for their medium power, the BB17000 and E40000 all had MU capability. SNCF made full use of this feature on heavy freight trains and then on push-pull sets. To my knowledge, TCDD did not use this capability, nor used the E4000 on freight trains and the equipment was removed on some units. Projected drawing done by Jacques Cooper, Alsthom in house designer who devised the livery. February 1971. Collection Jacques Cooper, published in "Cooper l'hommme qui dessina le TGV" by L. Fieux, page 114. Factory picture of E40001. Collection Jacques Cooper. Published ibid. E40008 at Haydarpasa, January 2001. Photo Gökçe Aydin.